So let's begin with what specific changes that were done this year. First off was the location. 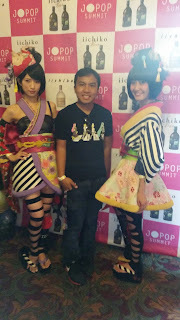 At last year's JPop summit, the location was at SF Japantown. Japantown itself is a pretty small area. Now add Ramenfest into the mix and that accumulated to half of the area taken over by long lines heading to the many ramen tables being offered during the event. The other half was for the other stands in the area most notably the sponsors that helped make JPop summit. Overall it was just a mess. There was so much overcrowding in areas that people can't walk around a whole lot. The ramenfest line was way too complex that people had to wait over 2 hours just for a bowl of ramen. With that , a relocation is needed. Therefore this year's event is located near the San Francisco Bay in the Fort Mason Center. A couple of miles away from Japantown but a much bigger location for attendees to walk around in. Second of all are side events that are incorporated with JPop Summit. Last year, the ramenfest also took place which accumulated to overcrowding. This year, they don't have that. Instead, there is more showcasing of what is in Japan from technology to travel which I will explain later in this report. Lastly is the guests. What showed out from last year's Jpop summit was that there were more japanese guests performing or appearing at this year's event. From last year's headliner, May'n, to this year's headliner with JAM PROJECT, I'd say this is a big improvement. With that in mind, let's see how JPop summit did this time around. Wait there's a day 0? Feels like a convention right? JPop summit started the day before the festivities began at the Castro Theater in the Castro district of San Francisco. 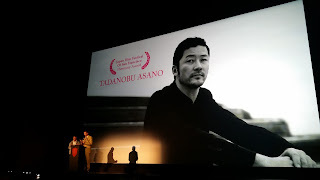 On that night, we would get to see Guest of Honor Tadanobu Asano receive a special award from the New People theater on his remarkable acting roles in cinema. I would arrive via BART at the mission district of SF where I would meet with my friend and would walk a couple of blocks to the Castro District. From there, we would find the Castro Theater and grab our badges from there. Along with the badges came a couple of freebies that include a shirt from Wikia and a bag that featured a well-known anime figure, Doraemon. We were there about an hour before the show began so we were invited to the reception that had most of the guests of honor there along with a buffet of great food for all the guests. I can't believe I had so much sushi and shoju on that night. And I even managed to grab a picture with a few guests of honor like Yanakiku and Little Glee Monster. When it was time to head to the theater, we would grab our seats and listen to a performer playing the organ before the show started, a little bit of what to expect next time we ever visit the Castro theater for a show. After a showcase of sponsors on the screen, the show would begin with the MC's talking about JPop summit as this year's being one of the biggest ones they have ever held. We would be able to get a speech from the chairman of J-Pop Summit and also a word from the Consul General of Japan in San Francisco. You know it's good if the Consul General makes an appearance to the show. Now with the introductions done, the show would celebrate Mr. Tadanobu Asano as he was honored with an award from New People cinema. You may know him recently in the Thor movies as Hogun and as Lord Kira in 47 Ronin. Besides these role, he has been acting in many films in Asia including the film we were seeing tonight: Electric Dragon 80.000V. This film stared Mr. Tadanobu in a lead role as a man full of energy. Literally. The film was from 2001 and even if it was a pretty old film, it showed Mr. Tadanobu as an actor in foreign films. He has been an actor since the 1990s and has been in many films since he started. For all of his acting duties, he was truly a person who should be awarded for his performance. When the movie was over, the MC would have a Q&A session with him for a half hour before we were able to ask questions to him. He was very pleased with everyone's questions and the audience gave a round of applause for Mr. Tadanobu as he walks off the stage. The night wasn't over though. There was actually another part to tonight's show. Of course the other part of J-pop summit is well.......the J-Pop part. So for the 2nd half of tonight's show, guest of honor DJ Ken Ishii would have his turntables on the side of the stage while we watched one of GOH Koji Morimoto animated works: Genius Party Beyond. The film was really stunning with amazing artwork and animation, that you ignore the fact of the randomness that was shown in the film. What makes it more attractive to see was that the beats of DJ Ken Ishii help make us see a better view of Morimoto's film and I was really entertained to see this. This lasted for about 15 minutes. The night would end there but the guests of honor would still be there to take pictures with those who viewed the show. I would be able to take pics with a couple of them before leaving the Castro Theater where I would head home via BART. The festivities all begin tomorrow but tonight was a really great start to what will become of this Jpop Summit weekend. I wouldn't arrive at Jpop summit until later on in the day since I had work. I would arrive at JPop summit around 4pm and by then, most of the day's festivities were done. But I was able to check out a little bit of what the event would have to offer. When I entered Fort Mason Center, I would already see the displays that they are holding from fashion, to travel, to technology, and of course the music. Once you enter, you will already be at registration as the booths would already be on the left side of the entrance. Which is a pretty convenient service to have for people who need to get into JPop Summit and this year, you must have a badge in order to get into the festivities. And then you enter and see all the exhibits which actually looked pretty good knowing that companies from Japan actually came to JPop summit to showcase their products. Unfortunately with the limited time I had, I wouldn't be able to check those exhibits until the next day. What's special about this is that a couple of my friends are in this dance! After all the dances, the girls from FES*TIVE and last year's singles champion dancer, Butters, would talk about the performances and decide their winners while the MC tried his best to entertain the crowd as they were doing their work. After a couple of minutes, all of the contestants would be up on stage and the winners would be given gift bags courtesy of the judges. Unfortunately, my friend's group didn't win. But I still was really entertained with the dances of all the contestants and hope to see them dance again at next year's summit. After grabbing food from one of the food trucks and getting a desert from the famous Hello Kitty cafe truck, I would head back into Fort Mason Center for two of the biggest concerts that are happening on this night from guests of honor Eir Aoi and Jam Project. I would have the convenience to have front stage access to all the concerts as a part of me being part of Press. The MC would then introduce Eir Aoi where a piece of her music would play for a couple of minutes until she appears on stage to the JPop summit crowd. She would sing many of her hit songs including most of her anime songs including Innocence (Sword Art Online), Sirius (Kill La Kill), and for her Finale Ignite (Sword Art Online II). Her set list was only 40 minutes long, but it was an awesome concert nonetheless. 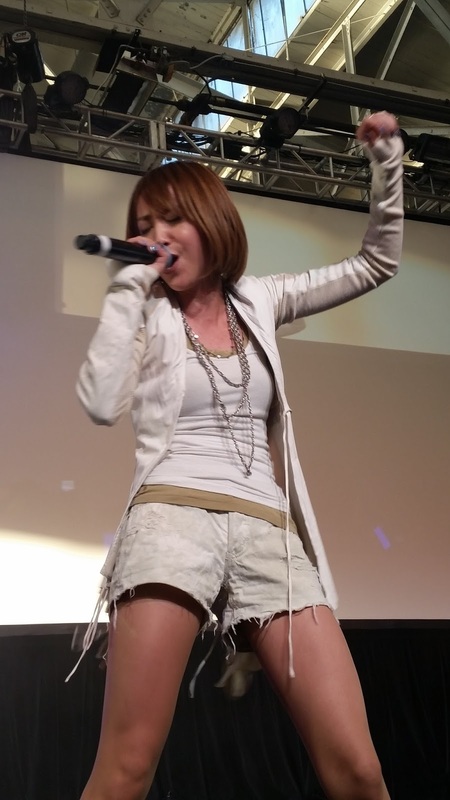 She was an amazing singer and was so happy to hear the cheers from us appreciating her coming to JPop Summit. She wishes to come back to San Francisco soon. Below is videos of her performance of Sirius and Ignite. There was a little break to bring out the headlining guest for the night: Jam Project. A team of 5 members that have each contributed to anime songs make up Jam Project. You may have heard them as they sang songs from Dragon Ball Z, One Piece, and Revolutionary Girl Utena for example. The 5 of them would be the last act of the night as they rocked JPop summit to the many fans out there. With a packed area in the stage, the MC introduced Jam Project and they began rocking the house down. They even had a separate performance where each of them sang their own anime songs that they contributed to anime before becoming Jam Project. For the rest of the night, the fans were thrilled as they heard their favorite songs from Jam Project while they rocked the night away. When they sang their last song, the fans wanted more. They kept screaming for an encore, but to no avail. The guards of Fort Mason Center wanted us out of the building for the night. No doubt about it one of the best concerts I watched! With all the access I could grab, I pretty much had the best spot in the audience and I was able to watch the concerts in amazement! With this much hype today, who knows what JPop summit will bring tomorrow! Even the MC loved their performance!!! I would arrive early when the doors opened at the Fort Mason Center for its 2nd and final day of JPop Summit 2015. When I arrived at the parking area, most of it was covered with sellers as a farmer's market was in operation in the morning of the Fort Mason center. So I checked around the parking lot around the outside of the Fort Mason center to see available parking there. There were but to those who were Exhibitors or VIP. Luckily, Press was considered as VIP so I was able to get a good parking spot close to the Fort Mason Center for no charge. Talk about privileges! As I got into the building where JPop Summit was held, I quickly went to the Kinokuniya area to grab some things for the guests of Honor to sign. One was a couple of CDs from Eir Aoi and about $30 of artwork from artist Yusuke Nakamura. The catch for getting these early is that with these purchases, I would be able to grab tickets for a signature session with the guests of honor. Best of all, I can pick a time when I can attend to it depending on my schedule. The only thing scheduled at the event was a VIP meet and greet with Eir Aoi later in the day so I was able to grad a ticket for her signature session a couple of hours before then. 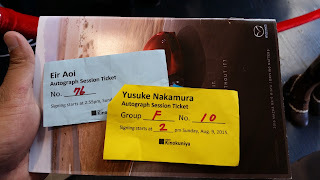 For the Yusuke Nakamura autograph session, I was able to grab a tickets after Eir Aoi's. With those at hand, I would glance around the building of JPop summit. To my surprise, it was a pretty organized event. The building was split into sections for guests to get intrigued with. Not only was Japanese Pop music was the topic around the event, but just Japanese culture overall was on display. Entertainment: This section had all the autograph sessions and meet and greets from all guests of honors as well as Kinokuniya. Fashion: Here, all of the fashion designers from Japan were showcased. The guests of honor for Fashion would meet with their fans out at the Moshi Moshi Nippon area where they could get autographs and get pictures from their designers. There was also a karaoke stage at this booth where fans can sing any songs from Let it go from Frozen to Kira Kira Sensation from u's of Love Live! School Idol Project. And they were also giving away free snacks to the attendees as well! Arts and Crafts: Local dealers and artists would sell their products here as well as get information of other conventions (like Animation on Display) and other Japanese areas of San Francisco that visitors would love to see. Travel: Many of Japan's tourist companies and known shopping stores would be showcased in this section of JPop summit. AEON is a mall company that has many of their shopping districts around Japan and were giving away items like Rilakkuma prize packs. All you have to do is enter a quiz and you win no matter what! There were the Go Torch characters that were also giving away stuff as long as you do their tasks. So mostly in this area you will be able to grab some free swag! Also you can be able to wear a Yukata and have an interactive experience of a Japanese hotel in the Ryokan Pavilion. Interactive Pavilion: The main sponsors of JPop summit would display their products for the guests to demo in JPop Summit. It is here where the Attack on Titan display, A showcase of Mazda cars outside of the building, Yamaha's newest products that included new automatic wheelchairs, and many other companies that are displaying their newest projects. Canon was also their to display new products for all the photographers out there. This area I was very intrigued. As a fan of the newest technologies, I really loved what these companies were working on. For example, one project is making a new way to track how many people lose calories by how many steps they take everyday, one is using bluetooth technology to make a household security system, and one that really intrigued me is where one project made a new invention that would take in which areas of the city would produce the most gas emissions. No doubt these inventions were going to be something big in the future and I was glad to see them on display! So I spent most of the time roaming around these areas until my time comes for the autograph sessions that I would attend to. First was Yusuke Nakamura where he would sign one of his art books I bought at Kinokuniya. I was there about 30 minutes before Eir Aoi's autograph session which is right next to his. While waiting, I would just play games on my phone and checking my streetpasses on my 3DS. Now I didn't really keep track of time until Eir Aoi's session started and I was still pretty far away from meeting with Yusuke. So I decided to skip out for a bit to join Eir Aoi's autograph session where I would get both CD's I bought from the Kinouniya booth signed by the singer herself! I would then be back into the line for Yusuke and would be there for another hour. People have been taking a long time to get his signature and I'm just very surprised. Then again, he rarely comes to events like these. Having him was a big honor for JPop Summit. Although it was pretty inconvenient. I had to skip out again and had to let someone in line hold my spot while I went to the Firehouse for the VIP Meet and Greet with Eir Aoi. All of us who got a ticket to this event via email would be able to attend this special meet and greet with the artist. The MC would introduce us to her and would let us have a 5 minute Q&A with her. Afterwards, every one of us would come up for a special photo with her! I would grab one with my phone camera. Below is the photo of me and Eir Aoi. Got some autographs to get today! 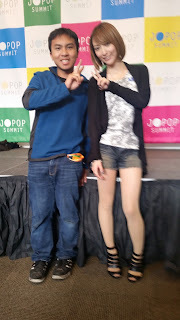 My moment with a great JPop singer! I would rush back to Yusuke's Nakamura's autograph session and the person I asked to hold my spot is already meeting up with him so I was actually next and came back at a really good time. 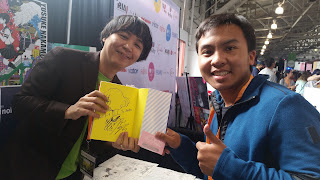 So I would meet up with him, gave him one of his books for him to sign, and I requested him to sign the book with a drawing of the girl from The Tatami Galaxy (He did contribute his artwork to the anime). While he was busy signing the things I requested, I was able to get a conversation with him (with translator next to him) about his time in San Francisco from what he likes from the city to the food that he loves in the city. He says that he would love to taste the clam chowder and that he is a fan of hamburgers especially the ones at his hotel. It feels like I was having an interview with him while he does with work. When he was done, I would grab a picture of him and me holding his book with his autograph on it. It was really great to see an amazing artist like him and I hope to see him in another event again! Mission accomplished! Got an autograph from the great artist, Yusuke Nakamura! After grabbing a bite to eat outside the building where the food trucks were, I would get back to the stage area where I would be able to see more of the performances from the guests of Honor. I would manage to see FEMM (Far East Mention Manequins), who performed in a way that I find very intriguing. So imagine seeing those robot androids that you see in futuristic animes and have a pair of those as a singing group. That is pretty much FEMM. The artists on stage were dancing like robots while singing to their EDC hits. They actually were walking around JPop summit like robots for photo-ops to the attendees. Their songs were pretty good to hear even if you think they are androids on stage. After their performance, the stage was being set for DJ Ken Ishii who performed at Day 0 of JPop summit at the Castro Theater. He comes back on day 2 to play his beats to the audience of JPop summit. As the beats play on, I would scout out into the audience who were having a great time dancing to his music. Some even made dancing circles and even some break danced in front of me. His songs are hits to me and it seems everyone in the audience loves his beats! After he performed, the stage would then be set for the headlining band of the night: Anamanaguchi. Now they were known for their music from the movie, Scott Pilgrim vs. The World as well as being the opening band for Porter Robinson in Crunchyroll's AX concert this year. Who knew that their next stop was at JPop Summit! They would spend the night away playing their hit songs to the JPop summit audience with their fancy style of rock and roll and weird graphics. Seriously, when looking at the screen on the stage, they place random stuff like anime, food, cats, dogs, etc. But what really mattered was the music because it sounded great! After their session, the MC gives off his goodbye to everyone at JPop summit saying that it was a successful one at their first time at the Fort Mason center! 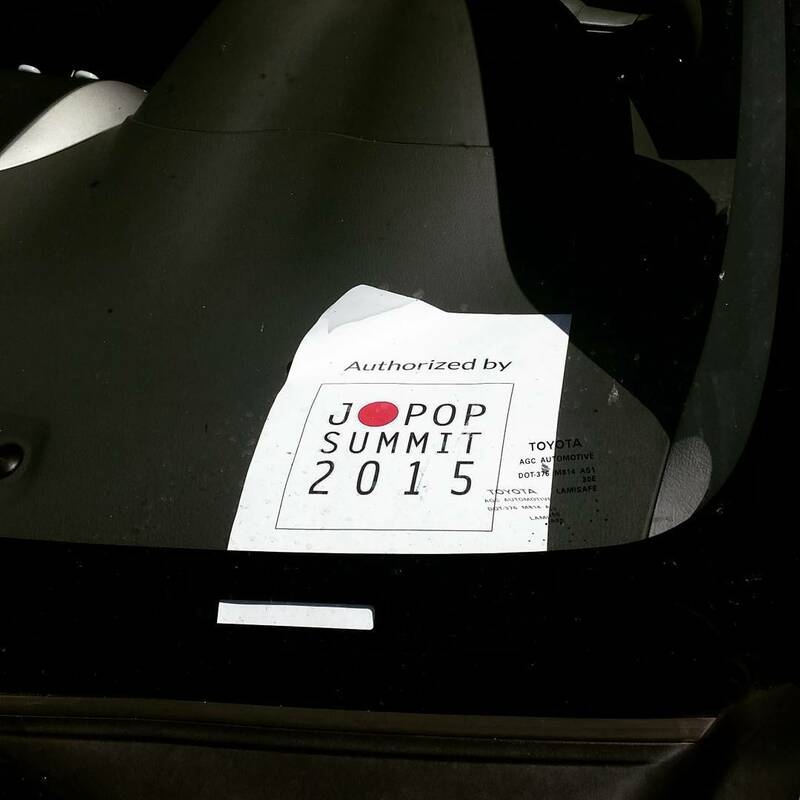 We can't wait to see what will be coming for JPop summit next year! DJ Isshi laying down the beats! Headliner of Day 2: Anamanaguchi performs! Does everyone love their performing backgrounds??? Well who would knew that after a mayhem last year at Japantown in SF, all that there was needed to make it better was a change of location. Although it may not be where it would always be located, the move was greatly needed. The Fort Mason Center provided more space for people to walk around and more room to showcase things which was a big focus for JPop summit. Instead of the usual music we get to hear from hit JPop artists, there is the side of Japan that doesn't get showcased as much in the summit. We don't really get to hear about things in Japan like its culture and plans to visit the city. This year, they began to put an emphasis on that aspect and it works out. With all the booths I visited, I never have heard that you can tour Japan in 3 weeks and it only costs less than $1000. A little bit more money and you would visit more places for a month in the well known country. And I love the fact they were giving away freebees at this event. It feel like I was at Anime Expo except with music instead. Although it does mean that you have to spend some money for this event, but looking at past JPop summits, if you actually went for free for the event, you wouldn't even be able to look at all the artists that were performing at the event. Also with the pagoda at Japantown SF where the stage usually is for JPop summit, the whole pagoda area would be crowded up with so many attendees that it would be very claustrophobic for those who want to watch performances. Now with a much bigger stage and much more standing room for attendees to see the performances, that problem has been resolved. Either way, you had to spend some money to go and watch a headliner like May'n last year in a venue a couple blocks away from Japantown SF. So why not have it all in one place where you would spend the same amount of money, listen to more headlining bands of the JPop genre, get freebees, autographs, and other kind of memorabilia? I'd say it's a really great deal! A little downside to JPop summit is that even with the building providing more space for all the attendees, all of its content couldn't fit in that building. In fact some events at JPop summit were spread out around the city, but the staff would still do their best to bring the style of JPop to those areas. The Sake Festival would be at Union Square where it usually is. This time around they added a Matcha Summit area where you can taste all kinds of matcha foods like ice cream, pancakes, and the usual tea. Food was offered there as well like sushi and onigiri. And the stage was set for local performances and GOH JPop artists like Fes*Tive and Little Glee Monster. So it pretty much was a mini JPop summit at Union Square, but what about Japantown SF? Japantown didn't have any events relating to JPop summit except for the building of New People where they were showing the Japanese Film Festival. Sad to hear that Japantown SF had nothing to offer much anymore but to be honest, it's for the better. The new venues have provided so much and I believe all the attendees as well as the guests of honor were in high vibes about this change. 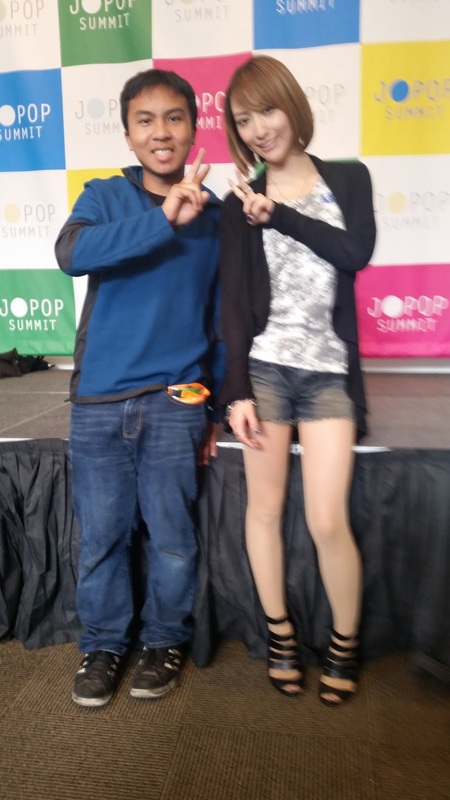 So to sum it all up, this Jpop summit was the best one I have ever attended! I've never had access as a Press member for this event and I was very happy with how I was treated at this event. The music offering was amazing, the guests of honor lineup was a good one, and I just like the fact with all the sponsors that were helping run JPop summit have contributed so much that I love to hear more from these booths. For Example, I would refer the NTA travel agencies for help in my planned travels to Japan, check out the AEON malls around Japan, check out a japanese hotel and wear a relaxing Kimono while looking out from my hotel room (I can just go on). I was just very informed with what Japan has to offer with innovations, fashion, music, and culture that I really love to visit there soon! The offering of music at this year's JPop Summit was spot on. We were amazed with all kinds of music in the JPop genre including pop (Eir Aoi), rock (Jam Project), Idols (Fes*Tive, Little Glee Monster), hip hop (DJ Ken Ishii), and a taste from our area (Anamanaguchi). No doubt about it, the lineup was outstanding and I was so glad to hear them all this weekend. And everything else from meeting with the guests of honor, the food selection, the 1000 treasures game was really fun too, and so many other offerings that made this JPop summit much more tolerable than previous years. I don't know how much I have been this excited to attend such an amazing event that everything was just spot on, no problems I had to face, just everything was just perfect. I really must give my thanks to Mr. Erik Jansen for providing me Press privileges for this event and just making the event so easy for me and not be stressful like some of the conventions I've been to. 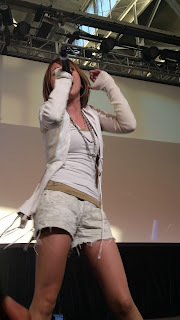 I've had an amazing time and I really would love to come back again for next year's JPop summit! Well that's all I have for my report on JPop Summit 2015. Yes, it's another long one but I hope the videos and pictures have entertained you and not get bored and all! Thanks for reading and I hope to see you at the next California anime convention!